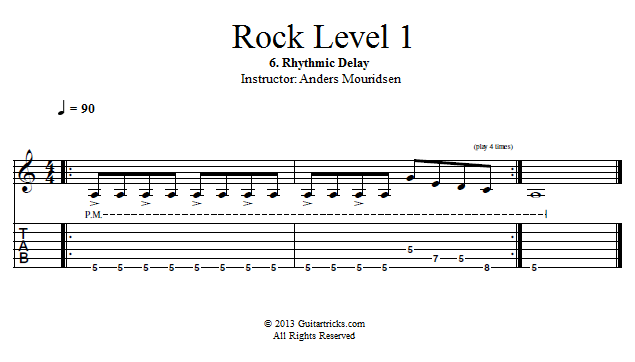 Now it's time to explore what I like to call rhythmic delay. This is a huge topic, and we could easily spend several tutorials on rhythmic delay alone, but in this lesson I'll give you a basic introduction. Rhythmic delay works best when the delay happens every 3 sixteenth notes. Some pedals have a "tap tempo" function, so you just tap in the tempo with your foot and the pedal finds the right delay time for you. But in this lesson I'll show you how to pick a tempo based on the delay time, which will work with any delay pedal. I hope you've gotten a good understanding of the different uses of a delay effect in rock. There are countless different types of delay pedals, and they all have different features and options. But they also all have some variation of the controls we've used today, so I hope you now feel equipped to go explore the rest on your own. Have fun with it, and I'll see you in the next video!